The Eight Hexagonal ring upper ring display the number 0-1 & the Upper & lower combined are used used to display the numbers 2-9 in a cryptic / fragmented forma. These digits are read from the outside inner ward. At the of Each of these concentric rings is a standard hexagon in the centre of the upper ring : AM / lower rings: PM indicator. Surrounding the hexagonal in a hour glass mode marker frame. This is used to indicate the selected mod: Alarm < >, Date: D, C: Charge: Wear Time, S: Stop watch , Hour glass symbol: Time (Default). At the centre of both the inner most Hexagonal ring is a further hexagon which are used as the AM: Upper / PM: Lower indicators. The watch case is two hexagons joined together creating a Figure of Eight shape in keeping with the style of the digits. 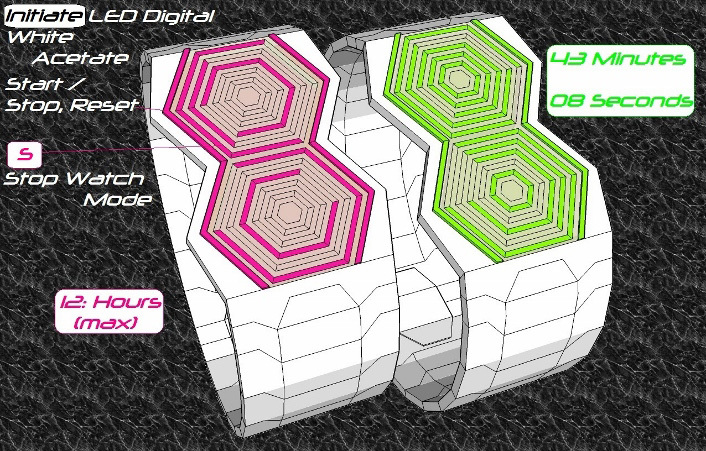 This watch has a futuristic space age style with a cryptic / fragment display. 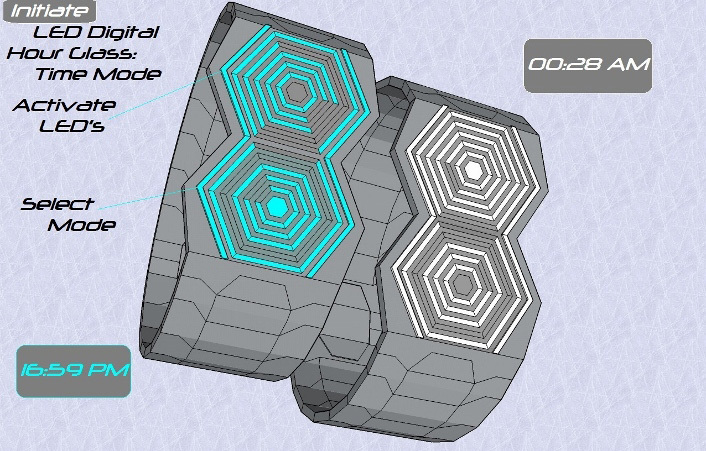 This entry was posted in Design Submissions and tagged Bracelet, cryptic, digital, futuristic, hexagon, LED Watch, USB Rechargeable, Watch Design Submission. Bookmark the permalink. Cheer TF for being kind enough to publishing yet another of my designs. 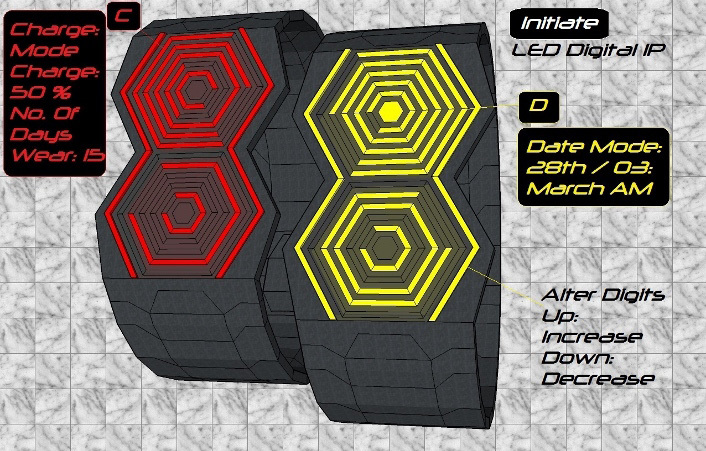 Diagram Number 2: Time Mode: Cyan / White LED’S, Case / Bracelet Gun-Metal. 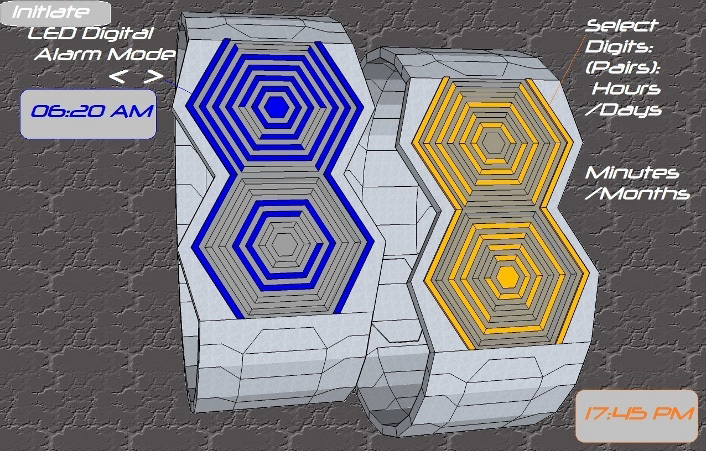 Diagram Number 4: Alarm Mode: Blue / Orange LED’S, Case / Bracelet: Stainless Steel. Cheers Pete I realise that the smaller hexagons may be harder to read & perhaps the Hexagons / concentric figure 8’S should meet in the centre. Furthermore figure of 8 shape could be improved / enhanced. Looks cool. It a liiiiittle bit too hard to read. I experimented with stacked digits (like we all did I believe) and gave up a lot (but not all) due to unreadability. I can imagine some really cool animations with this display though. Samukun: your right this display may not be for beginners but I hope it will appeal to fans of cryptic watches. I would love you or TF show me the Animation Ideas for this Watch. Sorry. Just saw you YouTube video and thought I was in search. Maybe need to wake up first! I do like this current watchm and how it is hard to read. My only concern would be the size of the case. Thanks Nev went I was creating Initiate wanted I decided to combined a concentric digits with a cryptic fragmented display. As for the size of the watch bracelet & case I think that it could have similar dimensions to other TF LED rechargeable watch such as: Neutron.